For over a century, the Danish thinker SГёren Kierkegaard (1813-55) has been at the center of a number of important discussions, concerning not only philosophy and theology, but also, more recently, fields such as social thought, psychology, and contemporary aesthetics, especially literary theory. Despite his relatively short life, Kierkegaard was an extraordinarily prolific writer, as attested to by the 26-volume Princeton University Press edition of all of his published writings. But Kierkegaard left behind nearly as much unpublished writing, most of which consists of what are called his "journals and notebooks." Kierkegaard has long been recognized as one of history's great journal keepers, but only rather small portions of his journals and notebooks are what we usually understand by the term "diaries." By far the greater part of Kierkegaard's journals and notebooks consists of reflections on a myriad of subjects--philosophical, religious, political, personal. Studying his journals and notebooks takes us into his workshop, where we can see his entire universe of thought. We can witness the genesis of his published works, to be sure--but we can also see whole galaxies of concepts, new insights, and fragments, large and small, of partially (or almost entirely) completed but unpublished works. Kierkegaard's Journals and Notebooks enables us to see the thinker in dialogue with his times and with himself. 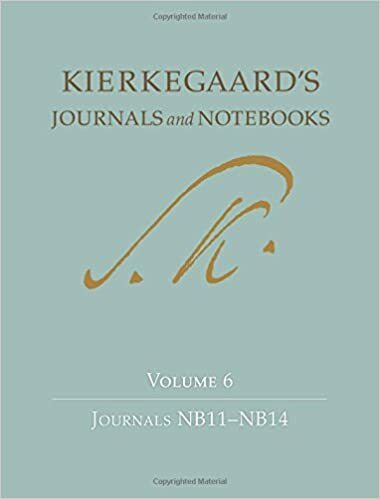 Volume 6 of this 11-volume series includes four of Kierkegaard's important "NB" journals (Journals NB11 through NB14), covering the months from early May 1849 to the beginning of 1850. At this time Denmark was coming to terms with the 1848 revolution that had replaced absolutism with popular sovereignty, while the war with the German states continued, and the country pondered exactly what replacing the old State Church with the Danish People's Church would mean. In these journals Kierkegaard reflects at length on political and, especially, on ecclesiastical developments. His brooding over the ongoing effects of his fight with the satirical journal Corsair continues, and he also examines and re-examines the broader personal and religious significance of his broken engagement with Regine Olsen. These journals also contain reflections by Kierkegaard on a number of his most important works, including the two works written under his "new" pseudonym Anti-Climacus (The Sickness unto Death and Practice in Christianity) and his various attempts at autobiographical explanations of his work. And, all the while, the drumbeat of his radical critique of "Christendom" continues and escalates. Kierkegaard wrote his journals in a two-column format, one for his initial entries and the second for the extensive marginal comments that he added later. This edition of the journals reproduces this format, includes several photographs of original manuscript pages, and contains extensive scholarly commentary on the various entries and on the history of the manuscripts being reproduced.